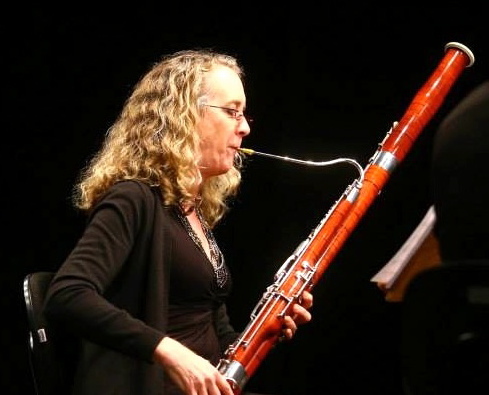 Janet Grice explores the versatile sound of the bassoon in a wide range of musical styles. Boston Globe’s Ernie Santosuosso wrote: “Best of Boston … Janet demonstrated the bassoon is equally adaptable to jazz or symphonic music.” Jazziz Magazine praised her debut recording, Song For Andy, “a gutsy, original idea … her classically grounded bassoon carries the session.” In Janet’s hands the bassoon expresses her deep connection to the music of Brazil in songs by Jobim, Moacir Santos, Pixinguinha and Hermeto Pascoal, as well as classics by Villa Lobos, Guerra Peixe and Francisco Mignone. Frequent trips to Brazil researching and performing its popular and classical music have led to Janet’s deep appreciation of the culture, and expertise in the musical field. Whether performing Brazilian music, classics, or improvisational and new music using electronics and extended techniques on the bassoon, Janet has contributed a unique voice to the groups of Butch Morris, STX Ensemble (Xenakis), Nana Vasconcelos, Larry Chernicoff, Don Cherry, Julius Hemphill, Anthony Davis, the Weekly Reeders, Mingus Orchestra, and Paulo Moura. As a leader, she performed for Jazz Forum Arts, 92nd St. Y, Lake George Jazz Festival, Flushing Town Hall, Celebrate Brooklyn, Boston JazzBoat, International Women in Jazz, the Grammy Foundation, Knitting Factory and SOB’s, and in Rio de Janeiro, Paris and Switzerland. Her jazz and composition projects were awarded grants from the National Endowment for the Arts, USArtists International and WestArts. Symphonic work took place with Daisy Jopling, Brooklyn Philharmonic, Londrina Symphony (Brazil), freelance groups in New York, and as a long-time member of the Chappaqua Orchestra. A champion of Latin American music, she presented little known works for solo bassoon and with Vento Trio at International Double Reed Conferences, the Hoff Barthelson Music School, throughout the NY metropolitan area, and the Festival de Música de Londrina and RioWinds Festival in Brazil. Janet began playing the bassoon as a teenager, participating in the Greater Boston Youth Symphony and Tanglewood Institute. She earned a bachelor’s degree from the New England Conservatory, where she studied bassoon with Steven Maxym and jazz with Ran Blake. After graduating Janet honed her improvisational skills at the Creative Music Studio in Woodstock, performing internationally with Karl Berger. Further jazz studies took place with Charlie Banacos, William Thomas McKinley, George Coleman, and with Jim McNeely at New York University for a master’s degree in Jazz Composition. Awarded a Fulbright in Brazil, she studied with Noel Devos, the country’s premier bassoonist. This established the groundwork for a doctoral dissertation on Popular Styles in Brazilian Bassoon Music at Rutgers University, where she earned a DMA studying with Brian Kershner. Janet’s discography includes Music Minus One: Solos for the Bassoon, 3 releases of Brazilian jazz on her label, and 2 CDs by Vento Trio featuring her original composition, Hudson Views, and choro arrangements. She co-produced a CD for her high school band, Fordham Road. As a side musician she recorded with Lee Tomboulian, Itaiguara Brandão, Bernie Worell, Leroy Jenkins, Eve Beglarian, John Lurie, and for commercial jingles and soundtracks. Currently Janet is professor of bassoon at the Hoff Barthelson Music School, runs a private studio, and is a NYSSMA judge. She taught bassoon at the Festival de Música de Londrina in Brazil, NYU, Hackley School, Masters School and RiverArts, and was a presenter at Double Reed conferences in the USA and France, Brazilian universities, and the Meg Quigley Vivaldi Competition. A New York State certified music teacher, Janet recently retired from the NYC Department of Education, where she directed instrumental music at Fordham High School for the Arts, and facilitated teacher professional development programs. As a jazz educator, she led her school’s big band in award winning performances, and led improvisation workshops in Brazil and France. Deeply committed to music education, she received awards from the Surdna Foundation for work with underserved youth in Brazil and the Bronx. Higher education teaching took place at Rutgers University, Westchester Community College, Rowan University, and St. Joseph’s College, and as a teaching artist for Carnegie Hall and Lincoln Center Education. Listen to songs from my upcoming CD!